Talk to visitors over your audio doorbell without getting out of your chair! 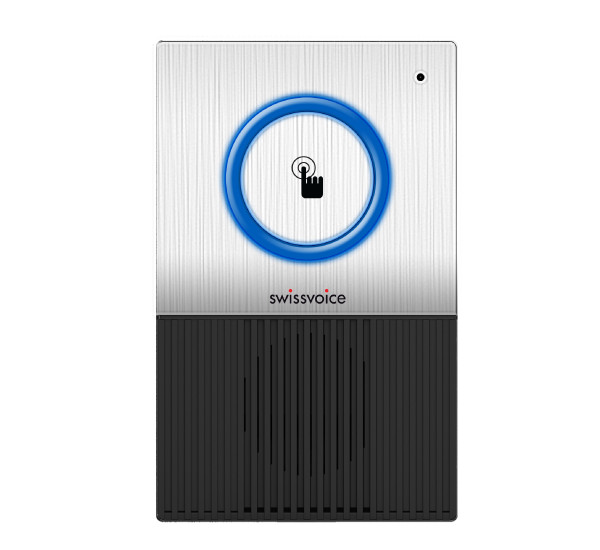 Xtra Doorbell 8155 is a wireless audio doorbell that calls your Swissvoice Xtra 2155 or Xtra 3155 DECT telephone. Communicating with your visitor is as easy as can be, even from your armchair! The audio doorbell has its own ringtone on your DECT telephone, so you can tell immediately when a visitor has rung your doorbell. The ringer volume can be adjusted from your Xtra 2155 or Xtra 3155 (5 levels). Up to 3 audio doorbells can be added to your Xtra 2155 or Xtra 3155 telephone. Blue LED flashes when the bell rings. Basic resistance to water and humidity (non-waterproof product: IP 23).